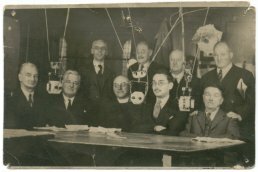 This is a postcard (unknown publisher) of one of the first BBC broadcasts from Man of Ross House on the 14th December 1934. Various well known locals were invited to tell the story of the town. 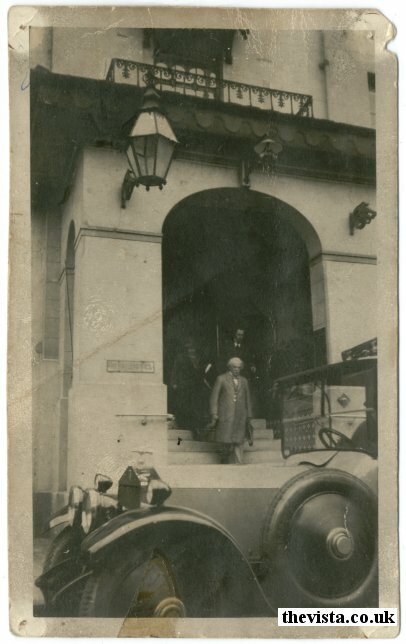 This is a postcard (unknown publisher) of Lloyd George leaving the Royal Hotel in Ross. 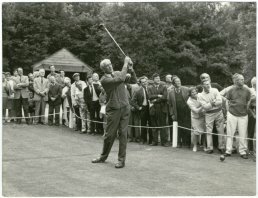 He often used to stop in Ross whilst he was on his way from North Wales to London. 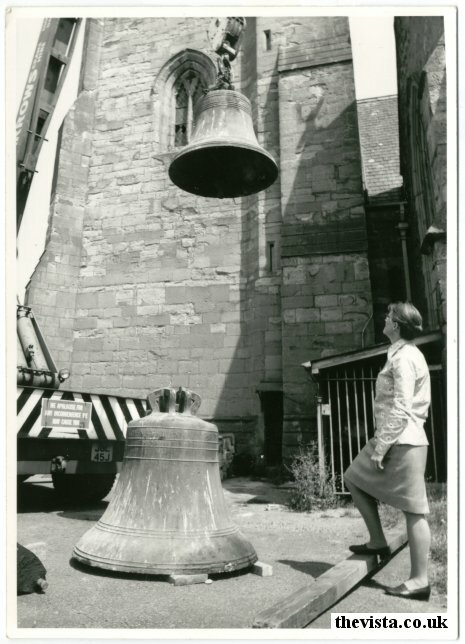 This is a photo from June 1976 when the eight bells were removed from the church tower whilst Miss Ann Butcher looks on. Miss Butcher was the Secretary of the tower. 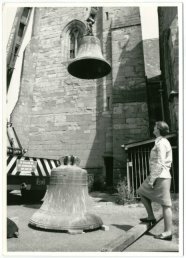 This was the first time the bells had been removed since they were cast in 1761 and they were taken to Loughborough for tuning and turning. 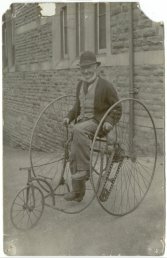 This is a photo of a man on an interesting bike. 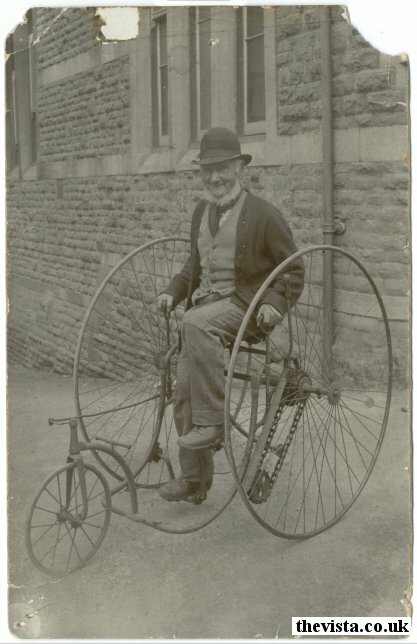 Ross had many bike manufactures and engineering companies so I assume this bike was made in Ross. 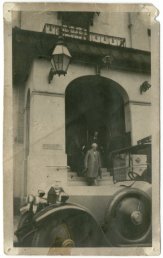 This shot was taken outside the Primary School that used to be on Cantilupe Road (where library is now) and is most likely in the passageway that runs between the library and what is now the registry office. 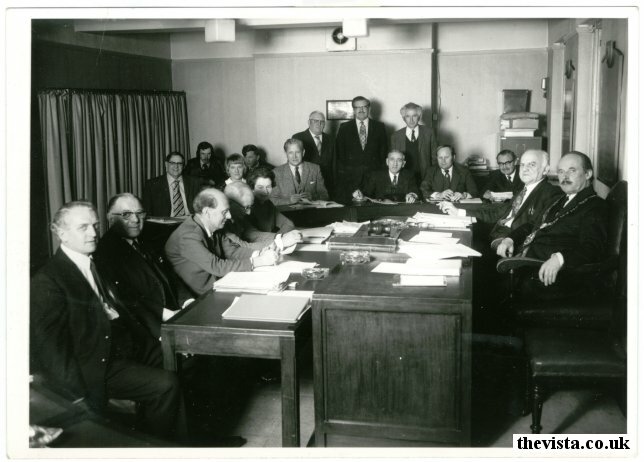 Here we see the final meeting of the Ross Urban District Council on 25th March, 1974. 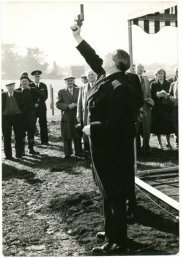 In March 1958, the M50 motorway was started, and it opened to traffic in November 1960. The photo is reputedly the start of the work building the motorway, and the man firing the flare may well be Mr. Ernest Marples, who was the Minister for Transport. 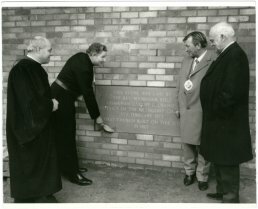 The M50 was seen as a vital part of the link from Birmingham to South Wales and its building was given priority over many other motorways for that reason. It's 21 miles were designed to be covered in 20 minutes at 70 miles per hour and, in 1961, it was expected to be able to carry 10,800 passenger car units a day with this increasing in the future to a maximum of 35,000 car units per day. As part of the design a maximum curvature on corners was 2,046 ft radius, with a maximum gradient of 1 in 25 and a minimum of 800ft visibility at a cost of approximately £6,000,000. 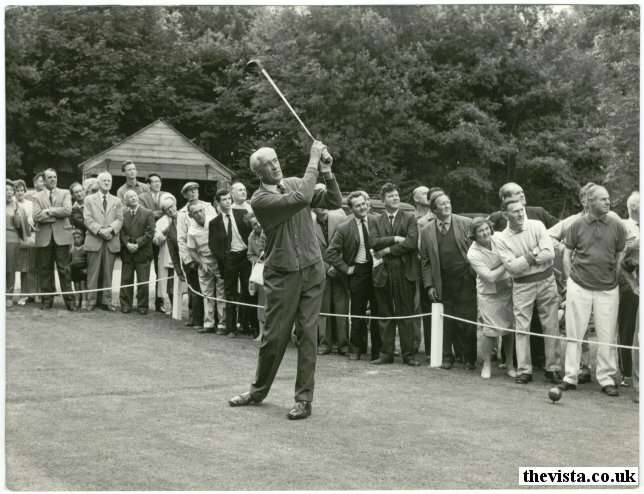 In 1964, Colonel John Maclean who was Lord Lieutenant of Herefordshire and President of Ross Golf Club opened the first nine holes of the new club at Jay's Green. 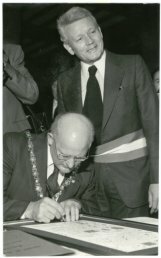 In 1978 Ross and Condé-sur-Noireau, Normande, were twinned. A charter was drawn up and was signed at the top of the Market House steps, in front a large crowd, by Kenneth Riches, who was the Mayor of Ross, and Maurice Piart, who was the Mayor of Condé. 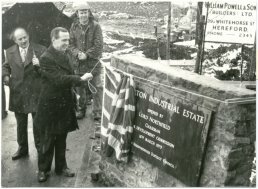 Here we see Lord Northfield, who was the Chairman of H.M. Development Commission, opening the Ashburton Industrial Estate on the 16th March 1979 which is on the site of Ross Railway Station. This is a photograph of Rev. 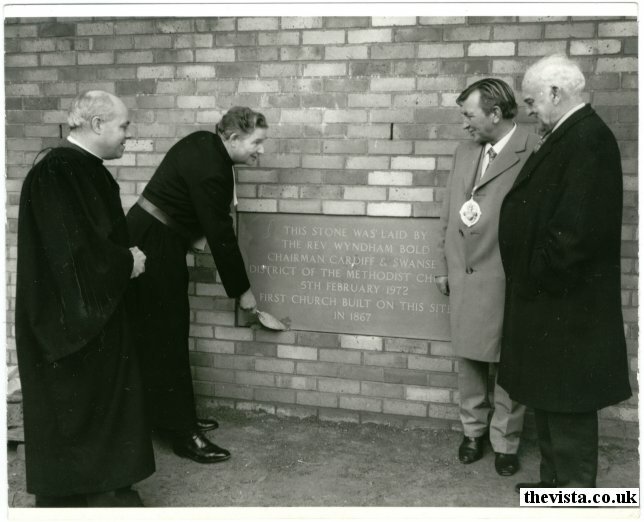 Wyndham Bold, who was Chairman of Cardiff & Swansea district of the Methodists Church, laying the final stone of the new Methodists Church on Edde Cross Street on the 5th February 1972. The church replaced an earlier one that was built on the site in 1867. 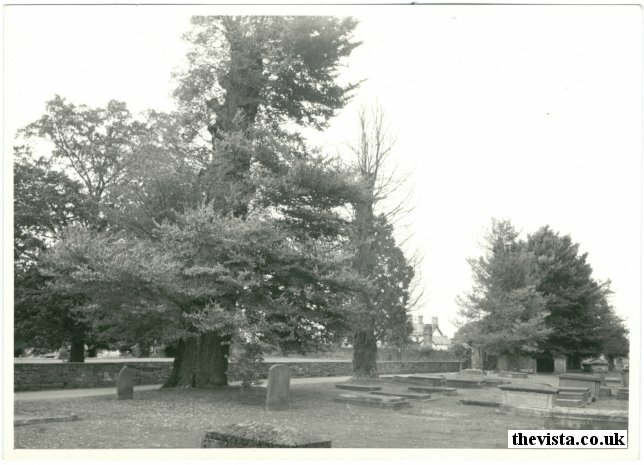 Here we see some of the elm trees in the church yard, the one on the right was broken by a storm in January 1974. The trees had been very badly affected by Dutch elm disease and so just after the storm they were all cut down during the clear up operation. These trees were supposedly planted by John Kyrle.